Thank you for your interest in Jarrow Montessori School. We look forward to getting to know you and your child, as you embark on this exciting process of finding the right school at this important time in your child’s early education. 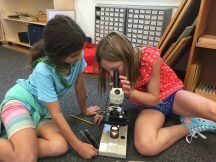 Established in 1964, we are the oldest Montessori School in Colorado, with full American Montessori Society accreditation. As a result of our rich history and commitment to high standards that are reflected in a Montessori curriculum, along with our loving and experienced faculty, Jarrow students receive an unparalleled education that teaches kindness and courtesy, independence and a love of learning. Our classic Montessori curriculum focuses on language arts, mathematics, geography, science, cultural studies, peace studies, sensorial integration and practical life. When you join Jarrow Montessori, you become a part of a warm and welcoming community working together collaboratively and respectfully. 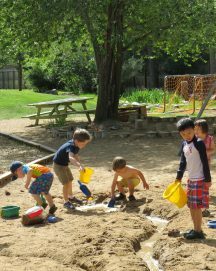 Our promise is to provide each child with safe and beautiful Prepared Environment and experienced and credentialed Montessori teaching staff. Our classrooms are equipped with Montessori materials specifically designed to engage curiosity and build mastery. These materials and the Montessori approach assist students in reaching their potential while developing confidence and respect for self and others. The development of social, emotional, physical and cognitive skills and interests are a balanced endeavor, as each child’s individual gifts and needs are developed and honed. At Jarrow, we invite you to be an active part of our community. Take time to fully understand the Montessori approach by attending Parent Education events, asking questions and observing in the classroom. Volunteering time and talents! There are many ways to contribute and many opportunities to get involved at Jarrow. Stay informed by reading our bi-monthly Jarrow Journal, checking our website for updates, and keeping up with regularly published classroom newsletters. Help support developmental continuity by applying using Montessori principles at home. Join us in this unique approach to education and our daily endeavor of Education for Peace. The journey starts with admissions. In the pull-down menu above are the admissions process, application, and our schedule of tuition and fees. There is also a list of frequently asked questions to help you navigate the process more easily. We would suggest that, as a first step, you complete the “web inquiry” in the Request More Information link, and, with this electronic prompting, I will be in touch to begin the process by contacting you to schedule a school tour and a classroom observation. We are excited to meet you and your family. In the meantime, please feel free to call our Admissions Office with any further questions: 303-443-0511 x 113 or you may email me at gavin.green@jarrow.org.